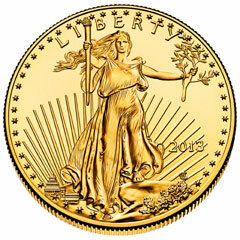 After two months of weakness, the American Gold Eagle bullion coins achieved stronger sales during the month of October. Silver Eagle bullion sales exceeded three million coins for the month, with the all time annual sales total quickly approaching. For the month of October 2013, Gold Eagle bullion sales reached 48,500 troy ounces across all options. The most popular seller by both units and total weight was the one ounce size at 41,000 pieces. The latest monthly sales total breaks the streak of two uncharacteristically weak months. In August, sales were 11,500 ounces, followed by sales of 13,000 ounces in September. The total for August had marked a six year low for monthly sales. Compared to the year ago period, Gold Eagle bullion sales showed a decline of 29.2% when sales reached 68,500 ounces in October 2012. Sales of the American Silver Eagle bullion coins reached 3,087,000 pieces during October 2013. This was up slightly from the prior month when sales were 3,013,000 ounces and down slightly from the year ago period when sales were 3,153,000. Silver Eagle bullion sales continue to be conducted under the US Mint’s allocation program, which is imposed when demand exceeds the available supply of coins. The quantities available to authorized purchasers are rationed, meaning that monthly sales totals are not necessarily a reflection of overall market demand. For the year to date, Silver Eagle sales have now reached 39,175,000. This is within striking distance of the all time annual sales record of 39,868,500 reached in 2011. During the month, the US Mint also offered the one ounce 2013 Gold Buffalo bullion coins, which recorded sales of 18,000 pieces. The America the Beautiful Five Ounce Silver Bullion Coins had sales of just 6,600 pieces.